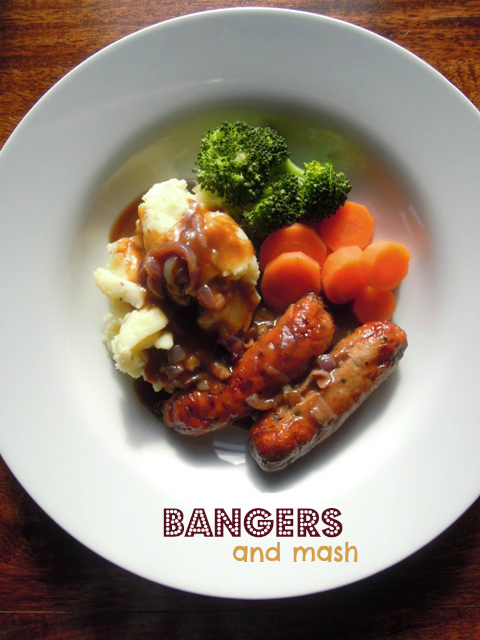 It’s only taken me a couple of years, but finally bangers and mash makes an appearance on my blog. There’s been a sausage pasta, sausage chilli, sausage bake, sausage and noodle soup, and even a Star Wars sausage stew, but this is the first time that classic pairing of the humble sausage with mashed spuds has been allowed to take centre stage. This month’s Family Foodies challenge, hosted by Lou over at Eat Your Veg and me, is all about the food you cook to show your family how much you love them, and I simply couldn’t not enter my good old bangers and mash. 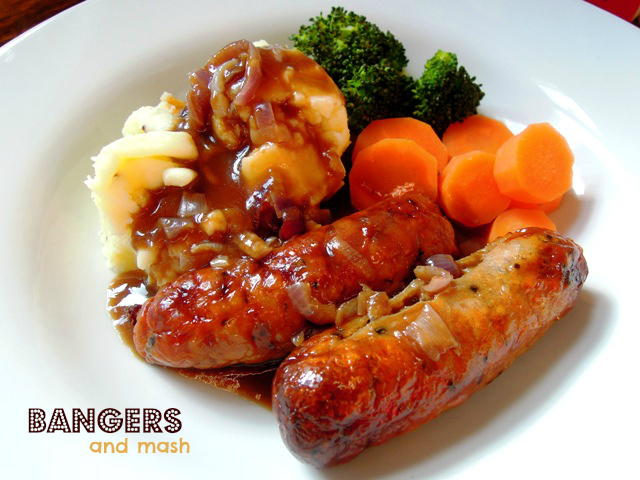 If my children are feeling low or have had a demanding day, then bangers and mash is one of those tried-and-tested dinners that is sure to put a big, beaming smile back on their faces. It works for my husband too. It’s a hug on a plate, all covered in gorgeous gravy. I tend to buy my sausages (and indeed most of my meat) from the local butcher, and I always go for the best I can possibly afford. I would rather spend more on good, free range, locally reared meat and eat less of it, than buy cheap, lower welfare meat which never tastes as good. While pork sausages must have a minimum meat content of 42 per cent pork, I try to make sure my sausages contain at least 70% meat. Fried sausages are of course quite delicious but I usually grill mine as it’s ever so slightly better for you. It’s important to choose a good floury potato for your mash, such as King Edwards or Desirée. Peel and boil them until just tender, drain and then add a generous knob of butter to the hot potatoes and allow to melt before mashing them with a dash of milk, a dollup of wholegrain mustard and some salt and pepper. I rather like my mash to be a little lumpy. It’s not an excuse honest; in fact I have a slight aversion to the super smooth ‘creamed’ potato you get in restaurants – but each to their own! Heat the oil in a heavy-bottomed saucepan and add the onions. Turn the heat down low, cover with a lid and leave the onions to cook gently for around half an hour or so, until soft and translucent. Give them a quick stir every now and again. Stir in the corn flour and cook for a few minutes, before pouring in the hot stock and redcurrant jelly. Cook for another 15 minutes to thicken. Check for seasoning before pouring into your gravy boat and then smothering all over your bangers and mash. Delicious! As I mentioned before, I’m entering this dish into February’s Family Foodies challenge (hosted by Eat Your Veg and me) where the theme this month is LOVE. Ahhh, there really isn’t anything quite so comforting as a good plate of bangers & mash. I quite agree re. the quality of sausage – there are nothing so bad as those el-cheapo mass produced ones. I’d rather go without. Absolutely! 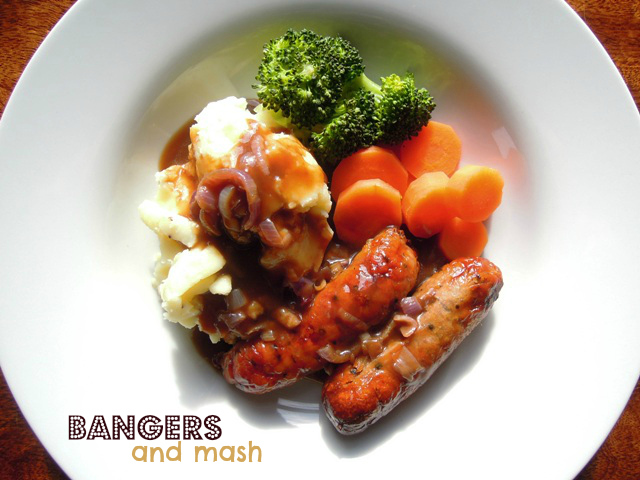 Bangers and mash hits the spot with kids every time, especially with onion gravy. This is one dish which always has my little one drooling! Being gluten free, we have found that all the sausages we can eat tend to be 90+% meat, which just taste so much better. One benefit of being coeliac, I guess! 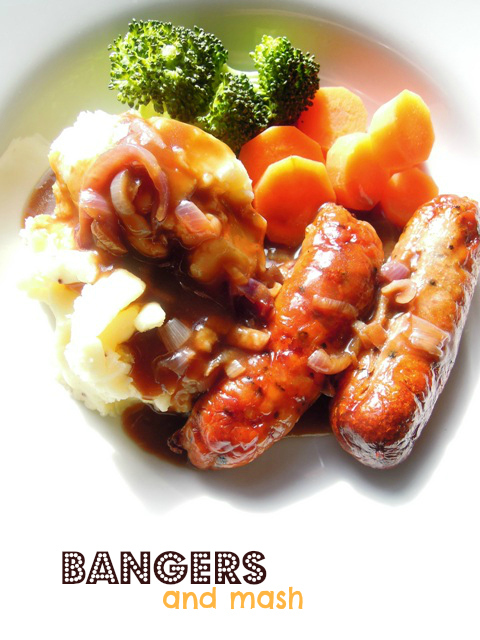 You’ve got to love a plate of bangers and mash, top comfort food and what I’m craving now! I’ve still got to post how we do fish fingers butties!